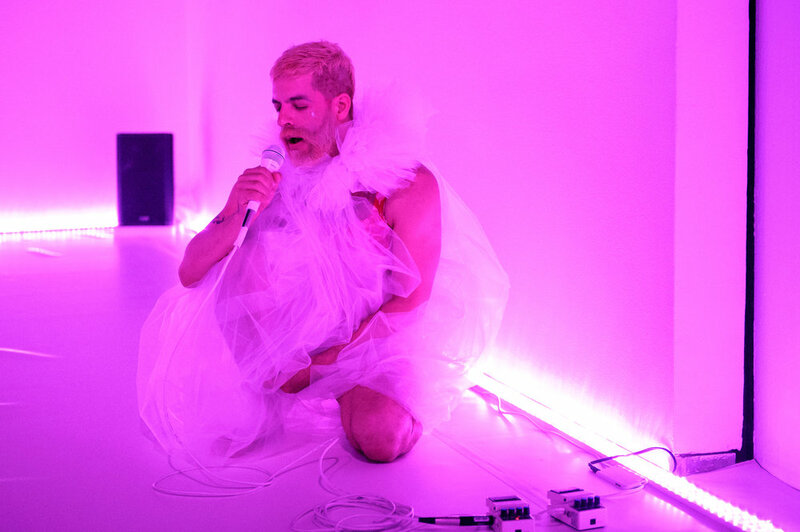 Age & Beauty Part 1: Mid-Career Artist/Suicide Note or &:-/ is the first of a suite of queer pieces that addresses queer time, futurity, and mid-life anxieties about relevance, sustainability and artistic burnout. Part 1 is a duet for 43 year old Gutierrez and 24 year old performer/dancer Mickey Mahar and follows from a set of precise unison dances to an irreverent and celebratory corruption of orderliness. This performance suggests modes of communication and relations where hyper-emotional affect is not only the conceptual and choreographic core of the performance, but also the only hope for continuing in this fucked up world. Age & Beauty Part 1: Mid-Career Artist/Suicide Note or &:-/ was commissioned for the 2014 Whitney Biennial and was made possible with support and developmental residencies from the Maggie Allessee National Center for Choreography at Florida State University, the ]domaines[ program at Centre Chorégraphique National de Montpellier Languedoc-Roussillon in Montpellier, France and Hollins University in Roanoke, Virginia.